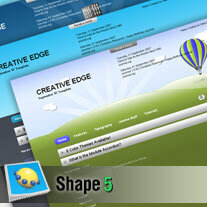 Shape 5 have released Creative Edge this month and the focus is very much design, but they've not just left it at that. When I say they've not just left it, what I mean is they've also added the great functionality from previous themes, so you sort of get the best of both worlds. The theme includes eight different colour options but it's more than just the colours that change. Each colour theme is almost like a separate theme in itself. The theme features the S5 width slider, S5 Box and the S5 Ultimate Drop Down. They've also introduced Unlimited Accordion Modules. The accordion functionality is activated by simply adding a class suffix to a module and full instructions are on the site. If you want more information or a demo, click here to visit Shape 5.